Additional information about shows, membership and points can be found in the top right corner of this page. We have some news that sadly, does affect the 2019 show season. There will be no shows at Buckeye Horse Park for the 2019 season. Please read the attached letter from Buckeye Horse Park regarding this. 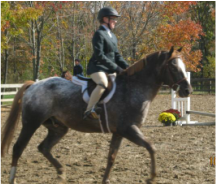 The June and September Double Point Shows will be held at at South Farm in Middlefield. We recommend those needing overnight accommodations book their hotel rooms soon. Check to see the standings! Check here for the show schedule, membership forms and more! !